This is sad . . . so sad that toilet paper cost more. I wish people understood the value of an ebook. It’s sad that people will spend more on coffee and junk than they will a book. They want them for .99 or FREE! 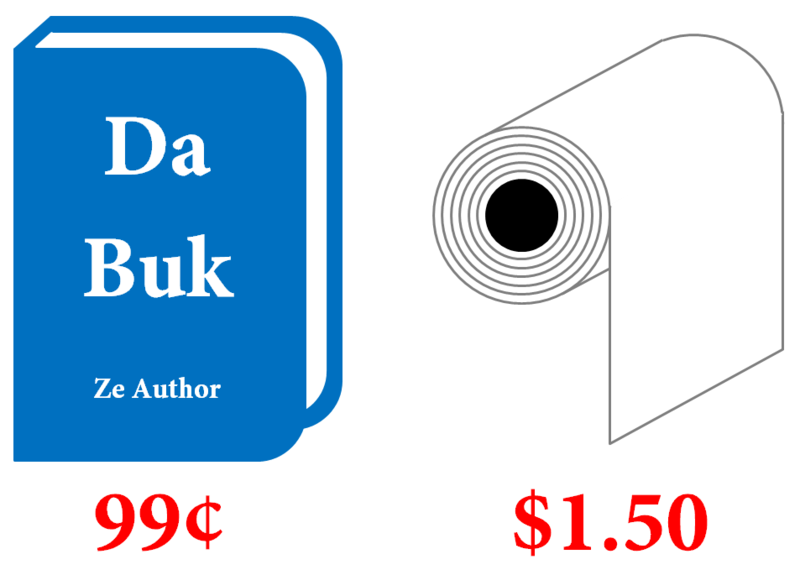 I gurantee that a writer worked harder to produce the book than whoever makes toilet paper. Definitely, if you consider the thought, time, effort, experience, etc. that is put into a good book. The author rightly considers the book to be a baby, but so many readers value the same book about the same as a cup of coffee. I believe popcorn and soda at the movies is almost as expensive as tuition at a community college. What does it say about people wanting to spend a lot of money on things with a one-time use, but get multiple use stuff for free? Thankfully, I’ve yet to test the little one with a movie theater beyond a school field trip to see ‘Frozen’. Though he gets upset if he drops food on the floor. He keeps waking up to look for snow and is sad that he can’t make an Olaf. What is the worth of a book? It’s frustrating for me as a book lover because I know back in the time of Jane Austen, books were coveted. You were wealthy by how many books you had in your library. Today, unfortunately, books equate a lottery ticket. Sigh. YOU made a very valid and valuable point The following responses were outstanding! Should have put Happy Meal on the list. 🙂 Books do supply happiness. Yes, there is a trust factor.